"Even my teammates are big fans of my Vicair cushion"
My name is Yvette Moerdijk, I’m 29 years old. In 2007 I moved from my birthplace in the beautiful province Brabant (red. The Netherlands) to the city of Amersfoort to start with an Expressive Arts Therapy bachelor program. Today I still live in Amersfoort. In 2008 I was a participant in a Dutch television show called ‘Blij dat ik glij’ (red. participants used self-made sleds to sled down a course in the snow in Austria). While sledding down I made a very unfortunate fall. During my recovery from the accident the physicians discovered that my scar tissue turns to bone. Because of this the knee in my right leg does not bend anymore and this leg is now always half stretched. After a long period of rehabilitation, this condition combined with my rheumatism landed me in a wheelchair in 2009. It may seem strange, but I would not want to go back to who I was before my accident. Somehow I am much happier now and I intensely enjoy the little things in life. Besides this, my disability has opened several new doors for me. Giving me the possibility to help people in similar situations to stay positive and happy. This is the reason that I’ve started the Infinita Foundation in 2013. 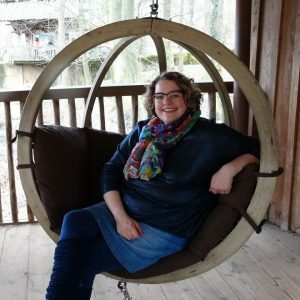 Over the last year the Bart de Graaff foundation – a Dutch foundation helping disabled young adults with the start-up and/or professionalization of their own company – has supported Infinita. An important part of my job is to give lectures to both disabled and able-bodied persons, in which I try to inspire them to live life to the fullest and help them turn negative experiences into something positive. Besides my work for Infinita I am also chairwoman of the Dutch Fibromyalgia Patients Association. Fibromyalgia is a type of soft-tissue rheumatism. Because of the calcification, my hypermobility and rheumatism, sitting correctly is a very important to me. In 2014 I came to know Vicair when I was searching for a cushion for my sports wheelchair. I started to follow Vicair on Twitter and learned more about the Vicair products. Soon it was clear to me: a Vicair cushion would be perfect for someone in my condition. I now use a Vicair Vector 10 on a daily basis, which provides me with so much stability that I almost don’t have to use my leg strap (to fixate my legs) anymore. Because of this I have much less pelvic pain. 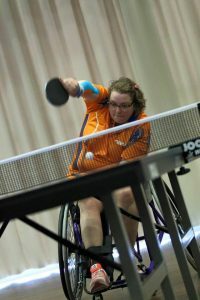 In October 2012 I was asked to join the Dutch Paralympic table tennis talent selection. I never expected to ever come this far in sports! Nowadays sports is a very big part of my life. I practise more than 15 hours a week, and I’m aiming to make this 20 hours. First I was using a standard foam cushion in my sports wheelchair, but I often suffered from pelvic- and hip infections. 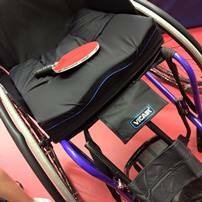 In 2014 I started using the Vicair Active cushion in my sports wheelchair. 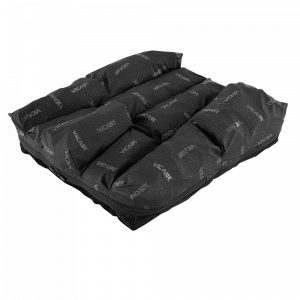 This cushion provides me with the stability and comfort to perform optimally. This is part of the reason why I’ve reached the 20th position on the World Ranking list. My long term goal is to play at the Tokyo Paralympics in 2020. In the nearer future I hope to win several international tournaments. And I am going to join the German table tennis competition for RSC Köln. As you can see, I am using two different types of Vicair cushions. Each perfect for the situation in which they are used. It is very special to experience how much influence a good cushion has on your daily functioning. I used to sit on another type of air-cushion, but that cushion didn’t offer much support and was very unstable to sit on. I felt like a bouncing ball. Very off balance. My teammates are big fans of my Vicair cushion. I play competition with able-bodied players. As soon as I get into my sports wheelchair, they start making deals about who may sit in my other wheelchair and for how long. Before I had a Vicair cushion, I never had to negotiate to get back into my own wheelchair! Sometimes it is necessary to offload the vulnerable area around the IT’s (seat bones) and coccyx (tailbone). The Vector O2 does just that. Its unique compartment layout further provides comfort, optimal skin protection, excellent leg guidance and extra pelvic stability. 100% machine washable and breathable.